Imperialism is increasing its interventionist acts in and around Venezuela. People’s protest against imperialism’s intervention in Venezuela is also spreading. The U.S. intelligence activities have increased by 800% at Venezuela’s borders while international media has focused on the “scandal” of Venezuelan and Russian military cooperation, Venezuela’s Defense Minister Vladimir Padrino Lopez said Friday. Padrino questioned silence of the mainstream media (MSM) while the U.S. seeks to violate Venezuela’s sovereignty. “No scandal is heard when U.S. planes land in Cucuta [Colombia] or when the U.S. Air Force electronic signals surveillance around our territory have increased by 800%,” said Padrino. The remarks come weeks after U.S. planes were sighted at a military air base near Bogota. A U.S. Army EO-5C reconnaissance aircraft, a specialized airplane used to intercept communications, was also detected. Several civilian-military maneuvers were carried out across the country by the Venezuelan Peace Squadrons (“cuadrillas de paz”), popular organizations which are aimed at protecting the security of communities, workspaces, study centers, water, electricity and other public services. Popular participation in homeland security is one of the ways through which President Nicolas Maduro’s administration is taking preventive measures to counteract the destabilizing actions of the U.S. backed Venezuelan opposition. Vice President of Communication, Tourism and Culture Jorge Rodriguez informed Saturday that Venezuela has been hit with a new wave of synchronized sabotages of the electric transmission lines. Many areas of Caracas reported no service beginning at approximately 7:11 p.m.
“In an attempt to undermine the tranquility of our people, these two attacks, perpetrated on March 29 and 30, add to the past aggressions, just when the decisive action of the Government and the workers had achieved the restoration of the electric service,” said the minster. The first sabotage on March 7 made a six-day countrywide electricity outage, which was allegedly executed by the U.S.
A second major sabotage of the electricity system was made on March 25. The El Guri Hydroelectric plant was targeted twice on the same day. With this background, Venezuelan President Nicolas Maduro tweeted: “I have the fullest conviction that we will be stronger than ever in the battle that is now being presented to us. We will defeat aggressions with the force stemming from the anti-imperialist spirit of Comandante Chavez. The fate of just causes will always be victory!”. Hundreds of people marched through the streets of Washington, DC, the U.S. capital, to oppose the upcoming NATO ministerial meeting in the US capital. The demonstrators also decried the continued US involvement in the Venezuelan political crisis. 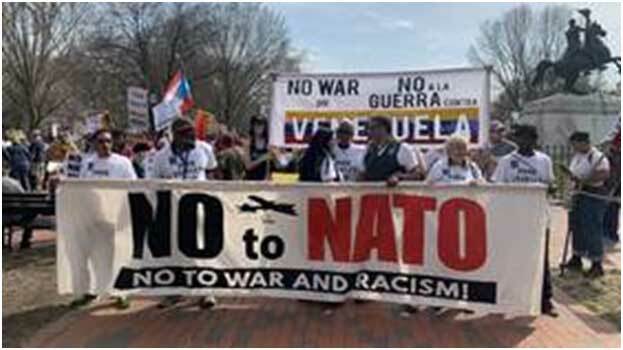 National Mobilization’s Steering Committee, a loose ad hoc coalition of activists representing dozens of peace movements and action groups, informed in a statement: The march was aimed at showing “mass popular opposition to NATO, wars, racism and US aggression against Venezuela. The demonstrators gathered at the Lafayette Square in front of the White House and then marched through the area, stopping near the offices of the International Monetary Fund (IMF), the World Bank and the Organization of the American States (OAS), which the demonstrators also held partly responsible for the “imperialist” policies of the West. They also walked past the Washington mayor’s office to address the local issues and the Customs & Border Enforcement office to highlight the plight of the Latin American asylum seekers coming to the US. Slogans also referred to the continued U.S. pressure on Venezuela. The meeting of the NATO foreign affairs ministers is scheduled for April 3 and 4 in Washington DC to mark the 70th anniversary of the alliance. Military veterans from Connecticut joined the Metro DSA, along with other activists, in the Washington D.C.-march to say “No to a Rich Man’s War!” in Venezuela or elsewhere. This is the beginning of a weeklong series of “Unwelcome NATO” events. The Venezuelans held a large mobilization Saturday in rejection of the series of sabotages of the country’s electricity system in the last 22 days. The U.S. with help of the rightist groups in Venezuela led the sabotages. The mobilization was named “The Popular Operation in Defense of Freedom”. One of the marches in capital Caracas included an act in solidarity with the workers of the National Electric Corporation (Corpoelec), the state organization in charge of the electric service. The marches moved to the headquarters of the Public Ministry. Political and social organizations and members of the public will deliver a signed document to the ministry requesting the acceleration of “the investigative processes against those who have betrayed the country,” said Vice President of Mobilization of the United Socialist Party of Venezuela (PSUV) Dario Vivas. Another march in the capital city walk from Plaza San Martin, paying tribute to the medical staff that have been at the helm of the care centers assisting patients during the electric blackouts. All marches converged at O’Leary Square, just steps from the Miraflores, the main seat of the government, where high government officials met the people with words of support. Cabello emphasized that the Venezuelan government has already initiated the pertinent actions against those who have violated the laws. He also stressed that the administration of Nicolas Maduro is holding meetings with representatives of opposition political parties. At the same time, the Venezuelan opposition led by Juan Guaido has called for anti-government protests at different points of the capital. The revolutionary multi-party alliance that ended apartheid supports the Venezuelan government and people. The Gauteng Province Secretary of the African National Congress (ANC), Jacob Khawe, welcomed Wednesday Venezuela’s Foreign Minister Jorge Arreaza to “the Solidarity Assembly with Venezuela” and condemned U.S. President Donald Trump’s sanctions against the Latin American country. “The fight for freedom must go on until it is won,” Khawe said quoting Oliver Tambo, a late revolutionary who served as ANC President from 1967 to 1991, a period in which the anti-apartheid leader and former President Nelson Mandela was a political prisoner. The solidarity event was held in Gauteng and organized by the Tripartite Alliance, a revolutionary force, which brought together the ANC, the Congress of South African Trade Unions (COSATU) and the South African Communist Party (SACP) in the early 1990’s. Besides conveying support messages, this international meeting was conducive to the exchange of experiences and the analysis of the global political situation. The participants agreed that the U.S. blockade against Venezuela, which has no basis in international law, is a real crime against humanity. “In the past, you were able to stand up thanks to international solidarity. Now it’s time to help Venezuela. The U.S. is preventing our economy from functioning. We work with Russia, China, Turkey, and India. Sometimes we send them oil and we buy goods to import them to Venezuela. This is something we could do with South Africa,” Arreaza said as reported by RFI, an African media. South Africa stood with President Nicolas Maduro at the UN Security Council meeting held on February 28, where it voted against the U.S. request of new elections in the Latin American country. On that occasion, the South African government stated that it “could not support the U.S. resolution as it reflected a serious bias, which goes against South Africa’s Constitution and foreign policy, as well as the letter and spirit of the Charter of the United Nations,” as the Daily Maverick recalled.